When looking for the best youth ATVs for sale, there is a lot you’ll have to consider! Do you want a battery-powered or gas-powered motor? 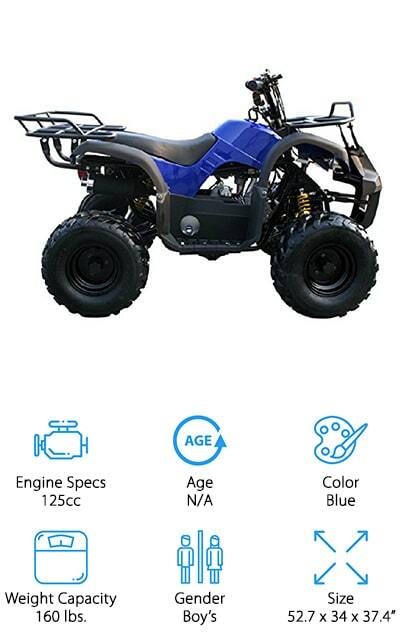 What size ATV will be best for your child? What safety features do they have? What if my daughter doesn’t want a “boy” one, or my son doesn’t want a “girl” one? Before buying your child their own ATV, here are a few key features to ensure you’re getting the right one for your family. Engine Specs: To help you choose the right type of ATV for your child, we’ll let you know the engine information, including the cc’s, volts, or amps the motor creates. That will help you choose a machine that’s both safe and fun! Age: Youth ATVs typically come with suggested age ranges that are appropriate for each vehicle. You can choose one that’s the proper size for your child to use safely, or buy one that all of your youngsters will enjoy driving around! Color: We also state the color of each ATV to help you choose the best style your child will enjoy! You can buy ones that match their favorite color, or grab a bright color that’s easy to see from a distance! 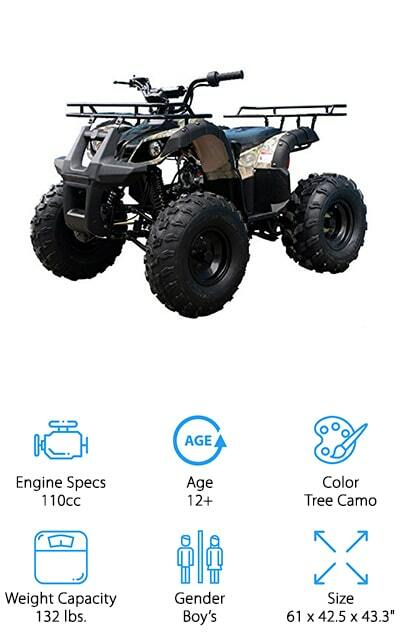 Weight Capacity: In addition to the suggested age range for each youth ATV, we also let you know their weight capacity. If your child is too heavy to ride an ATV, it can be both potentially unsafe and break down the motor. Gender: Some ATVs come in gender-specific designs, so we’ll let you know if they lean more toward boy or girl’s designs. Many of them work well for both boys and girls, so we’ll let you know if that’s the case too! Size: Finally, we will let you know the overall dimensions of each ATV. This is especially important if you plan to take your ATV with you in your truck or SUV, or if you have limited storage space for extra vehicles! Now that you have a good idea of which type of ATV is best for your child, let’s get into the reviews! We found 10 different ATVs that are great for young riders. There are small, slow ones for your little ones and full-throttle speedsters for your teens. If you don’t have time to read all 10 today, that’s fine! We started with our Top Pick and Budget Pick, so read those first and come back to read the rest! 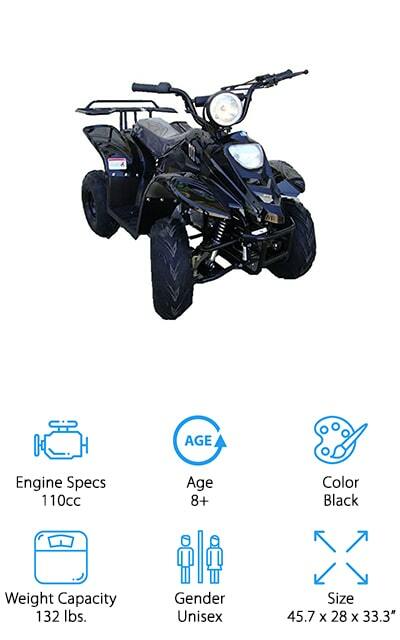 Our choice for the best youth gas ATV for sale is this one from TaoTao, a popular brand in youth and adult ATVs! The engine is fully automatic with reverse, so your child doesn’t have to learn how to shift gears to drive it. We like that the 110cc engine can top out at around 25 mph, which is plenty fast enough for experienced youth drivers. If you aren’t comfortable with your child going that fast, there is a governor that allows you to reduce the top speed to as low as 5 mph. 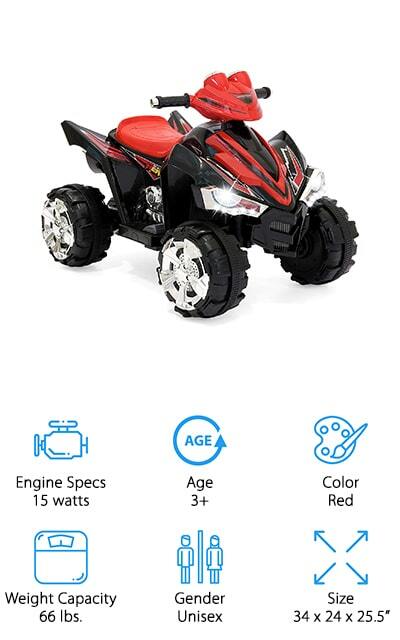 For added safety, this discount ATV has a remote kill switch you can control and a pull-cord that you attach to your child, which cuts the engine if your child falls out or they choose to pull it. 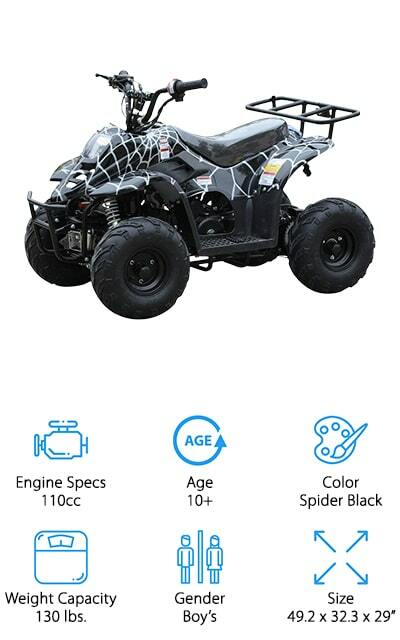 This ATV is made for kids aged 12+, so we suggest getting one of these for your older, more experienced ATV drivers to enjoy some speed and fun! If you’re on the hunt for the best youth ATV for the money, we think this electric ATV would be great for any young child looking for a speedy adventure! Instead of a gas engine, which can be expensive to maintain and fuel, this uses rechargeable 12-volt batteries to power it. This kids electric four-wheeler is great for ages 3 and up because it’s small, easy to use, and only goes up to 2 mph. There are also a lot of fun features your child will love to play with! It has a fast and slow setting they switch from the dashboard, and they control the motor with a foot pedal – just like you do in your car! It also has buttons to move the vehicle forward or in reverse, and they can also turn on and off their LED headlights for added fun! This is a fun, safe ATV for your little ones to ride all over the yard! If your child is ready to move from riding on the lawn to tearing up a dirt track, this electric youth ATV for sale from Razor is a great upgrade for kids 8 and up! It runs on 2 rechargeable 12-volt batteries, which means you don’t have to worry about buying gas or oil for your ATV! The throttle and brakes are all located on the handles, making it easy for your child to control while speeding around. We like that, as your child grows, you can adjust the handlebars to a comfortable height to improve their stability and safety. They also have a solid suspension and shocks, so your child will have a smooth ride, even while riding over bumps, rocks, and other messy terrain! For the child who’s ready to break out onto trails, dirt tracks, or ride around the farm, this youth ATV is a great way to keep them busy and speeding around all day long! Next up is this 110cc ATV for sale from ICEbear that we think is a great 4 wheeler for 10-year-olds! This mini ATV is great for small kids who want to learn how to ride a full-powered ATV while including safety features that will keep parents happy. The engine is fully automatic, making it easy for your child to hop on and ride without special instructions. It also has an electric start, so no worries about trying to work a pull-chain to get it going! We like that it comes with a throttle limiter and a remote kill switch, so parents can control how fast their child goes or stop when they feel it’s necessary. It also has a headlight and tail lights, so your child can ride this in darker conditions, and other riders can see when they stop! It also comes in 6 different styles, so you can find one your daughter or son will love! 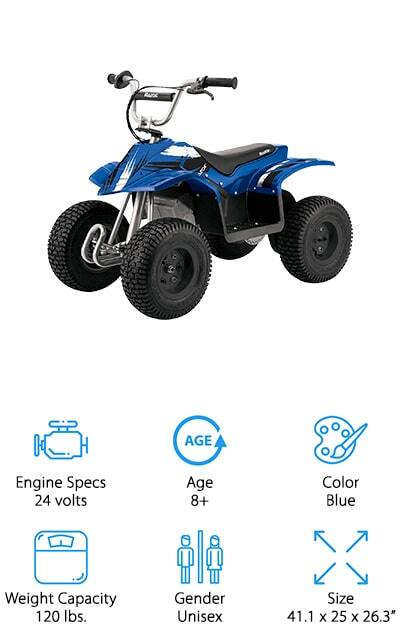 If you’re looking for a beginner mini ATV for sale, this one is great for young kids who are just getting started with gas ATVs. This is an incredibly safe ATV for your youngster, with a throttle limiter that controls the top speed down to as low as 5 mph. It also has a remote control kill switch that you keep with you, and you can use it to kill the motor whenever you feel your child is in an unsafe situation. The electric starter and automatic motor make this easy to learn how to drive, and it can go up to 30 mph when they’re ready for it! If you want to take it with you on the trails, you can add the rear rack to attach a picnic basket, camping equipment, or whatever else your child wants to carry with them! This is one of the best kids ATV options you can bring to your next family ride! 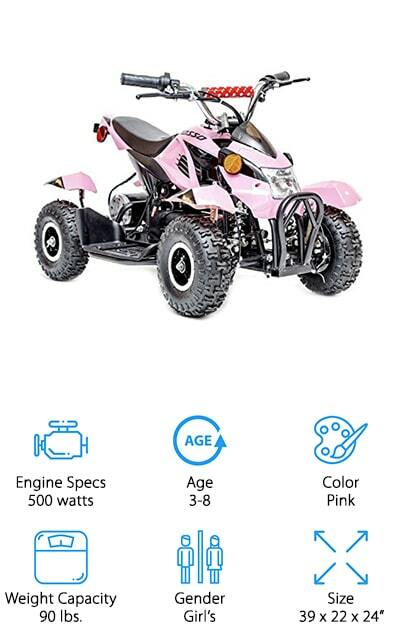 Want the best 4 wheeler for 6-year-olds that your young daughter will love? This rugged little ATV from Rosso Motors not only looks cute – it runs really well too! It runs on a rechargeable 36-volt battery, which will run for up to 2 hours, and it can go up to 13 mph! We like that it has a 3-speed governor to control the top speed, and it goes in reverse to get out of a jam. The disc brakes allow this ATV to stop on a dime. Also, the shock absorption system gives your little girl a smooth ride, even on rough terrain like gravel, dirt, and snow! The cotton candy pink paint job looks bright and cheery, and they could easily add decals, stickers, or paint to customize it to fit their style. For your little girl who wants to race around with the boys, give her a 4 wheeler she’ll love to run circles around them! Next up in our hunt for the best youth ATV is this fun little machine for kids aged 3-8 from Costzon. This ATV is perfect for your little one, with a top speed of about 4.5 mph, and a low-speed setting that’s about 2 mph. It’s easy for your child to use – just push the pedal down to go forward, and lift off to stop! It also does reverse if they get stuck! Our favorite feature? You can hook up your smartphone, music player, or tablet to the auxiliary port, so your child can listen to their favorite tunes while they drive – it even has a volume dial so they can crank up the volume! The large plastic tires have rubber gripping that allows them to ride on slick surfaces, like wet pavement or wood flooring. It even has a small rack on the back that they can attach a lunchbox or toys to the back for some added fun! Next up is a 125cc four wheeler for sale from MOTOR HQ, which we think is a great addition to your family’s ATV collection! This smaller ATV is great for teens and advanced youngsters who want to take their ATV on trips with their parents! It looks just like an adult-sized ATV, with racks on the front and back. They can attach camping gear for a night under the stars, a cooler for a picnic, or some fishing equipment to spend a day on the lake or river! It maxes out at 35 mph, which is plenty for a kid to get their speed rush. However, if you want to slow things down, it does have a throttle limiter you can adjust to keep things at an easier pace. It also has a remote kill switch, so you can control how far they go or stop them in an emergency. This is a great ATV for your pre-teen or teenager! 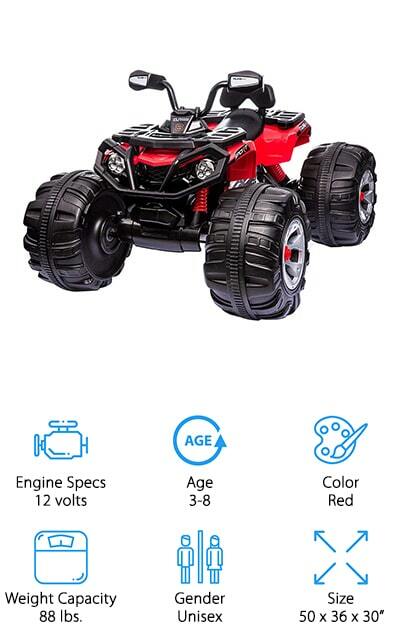 This electric ATV is a great 4 wheeler for 5-year-olds who want to ride around the yard! 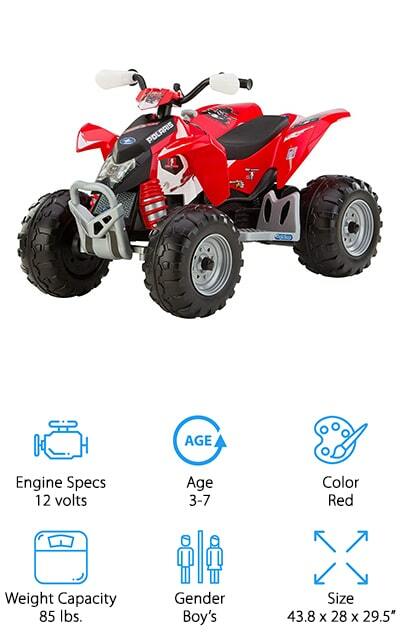 We like that this ATV is great for little kids to ride without worrying they’ll go too fast. It has 2-speed settings: low is 2.25 mph and high is 4.5 mph. There is a second gear lockout, so you can keep them from going any faster than you want! It also goes in reverse to teach them how to park their ATV, or get them out of sticky situations! We also like the look of this ATV – the plastic body looks just like the ATVs their parents are riding, with a bright red or pink paint job, flashy decals, realistic looking suspension, and rugged wheels. Your child will love riding around on grass, gravel, pavement, and more! It runs on a 12-volt rechargeable battery that only takes 2 hours to fully recharge, so they can get back to riding quickly! 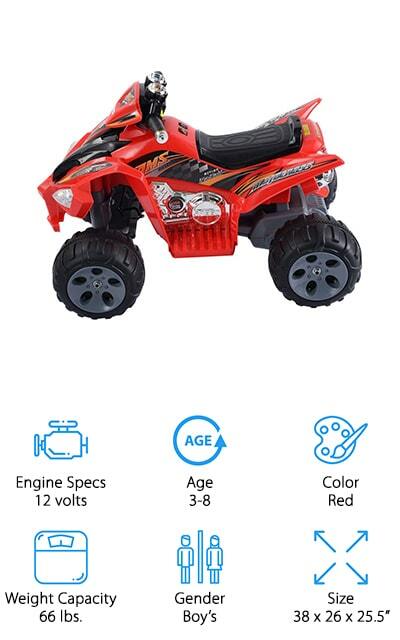 Last up in our youth ATV reviews is this battery powered mini 4 wheeler from Giantex that is perfect for giving your little ones a taste of speed – but not too much! This ATV is made for kids aged 3-8 and is perfectly safe for them to ride around the yard or in the driveway. It runs between 3-5 km/h, which is fast enough to keep your child happy, but slow enough that you could catch up to them if you need to! It also goes in reverse, so your child can get themselves out of tough spots in a jiffy! We also like that it has working LED headlights to help them see in dark places, like when they’re backing out of the garage. Oh, and it also plays music and has a horn! The look of this ATV is super cool, with a bright red body and fun decals that make it look just like a professional roadster!